The Tampa Bay Buccaneers had lost a record 26 straight games since coming into the NFL in 1976 as they faced the New Orleans Saints on December 11, 1977. Head Coach John McKay’s team suffered through a miserable 0-14 inaugural year and, at 0-12, seemed destined to go winless for a second season. 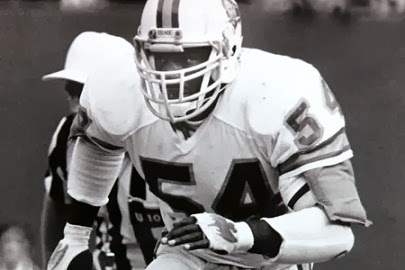 There was reason for hope, as the defense was showing signs of coming together and contained up-and-coming players like DE Lee Roy Selmon and his brother, LB Dewey Selmon. The offense was another story, however, as FB Ricky Bell, the team’s first draft choice out of USC, was struggling behind a poor line and the quarterbacks, led by Gary Huff, sustained many sacks and interceptions. The team had scored just 53 points in the twelve games and had been shut out in four of its previous five contests. The Saints were also struggling. The perennially losing club could not be turned around by second-year Head Coach Hank Stram, a proven winner previously with the Chiefs, and had a 3-9 record. QB Archie Manning had plenty of ability and there was a good backfield tandem in HB Chuck Muncie and FB Tony Galbreath. But the offensive line was mediocre and the defense was worse than that. Manning also antagonized the Bucs in the days before the game by stating that it would be disgraceful to lose to them – words that would come back to haunt him. There were 40,124 fans in attendance at the Louisiana Superdome for the contest between the two cellar dwellars. On the third play from scrimmage, Archie Manning fumbled while scrambling and Lee Roy Selmon recovered for the Bucs at the New Orleans 36. However, the break went for naught when Tampa Bay drove 20 yards and Dave Green missed a 33-yard field goal attempt. The Saints punted following their next series and DB Danny Reece returned it 20 yards to the New Orleans 28. Ricky Bell carried five times as the Buccaneers advanced a total of seven yards, but this time they didn’t come up empty when Green kicked a 40-yard field goal. The teams exchanged punts, but on the last play of the first quarter, Manning threw a long pass intended for TE Jim Thaxton that went through the receiver’s arms and was intercepted by CB Mike Washington (pictured at top). Tampa Bay started off the second quarter at the New Orleans 33 and drove 25 yards in ten plays. Bell and FB Jimmy DuBose ran effectively and Green finished the series off with another field goal, this time from 25 yards. The Saints remained stymied on offense and, after two punts were nullified by penalties that backed them up to their five yard line, the third was returned for 29 yards to the New Orleans 24 by WR Isaac Hagins. However, a holding penalty and seven-yard sack of Gary Huff backed the Bucs up and they were forced to punt. After the Saints punted again, Tampa Bay put together a 71-yard drive in six plays. Huff connected with WR Morris Owens for a 39-yard gain along the way and found Owens again alone in the corner of the end zone for a five-yard touchdown. Green added the extra point and the Bucs took a 13-0 lead into halftime. Tampa Bay had the first possession of the third quarter and had to punt, but Bobby Scott, now in at quarterback for the Saints, threw a pass that Washington intercepted and returned 45 yards for a TD. With Green’s extra point, the Bucs were ahead by 20-0. Now in a deep hole, the Saints responded by driving to the Tampa Bay 30. 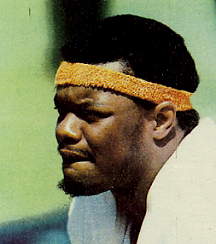 However, Scott’s arm was hit while he was throwing and it resulted in another interception, this time by LB Richard Wood (pictured below), who ran it back 30 yards to the Tampa Bay 47. With DuBose and HB Louis Carter carrying the load, the Bucs reached the New Orleans 30, but on fourth-and-one Huff was stopped for no gain on a quarterback sneak and the Saints regained possession. 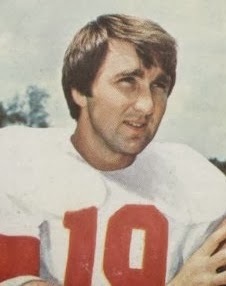 A Scott pass to WR Don Herrmann and a roughing-the-passer penalty on the Buccaneers helped New Orleans move to the Tampa Bay 29, but from there Scott tossed four straight incomplete passes to give the ball back to the visitors. The Bucs punted on the last play of the period, and then once more came through with a big interception on the second play of the fourth quarter. With the Saints backed up to their four, Scott was again picked off by Wood, who needed to return it only 10 yards for a touchdown. The extra point try was shanked but it didn’t matter – Tampa Bay had a commanding 26-0 lead. Midway through the fourth quarter, Manning returned at quarterback for the Saints and they finally scored as he ran two yards for a touchdown. The next time New Orleans had the ball, Manning faded back to pass from his end zone, the ball was deflected, and DE Greg Johnson caught it for another Tampa Bay TD. In the final seconds, Manning threw to WR John Gilliam for an 11-yard touchdown, but it did nothing more than salvage some pride for the home team. With a dominating defensive performance, Tampa Bay finally had a win to its credit, and by a score of 33-14. In a sloppy game in which neither offense distinguished itself, the Saints outgained Tampa Bay (250 yards to 238) and had more first downs (17 to 14). However, New Orleans gave up seven turnovers, to one suffered by the Bucs, and three of them resulted in interception returns for touchdowns (tying a NFL record that was broken in 1984). Tampa Bay also recorded five sacks, to one for the Saints. The Buccaneers were hurt by 11 penalties, at a cost of 100 yards, to seven flags thrown on New Orleans. Gary Huff (pictured at left) didn’t pass often, completing 7 of 9 throws for 96 yards and a touchdown with none intercepted. Jimmy DuBose ran for 59 yards on 17 carries and also caught a team-leading three passes for another 24 yards. Ricky Bell added 34 yards on 14 rushing attempts and Morris Owens gained 44 yards on his two catches that included a TD. But the biggest contributors for Tampa Bay were on defense, where Mike Washington and Richard Wood each intercepted two passes, and returned one apiece for touchdowns. Greg Johnson had one interception in the end zone for a third TD. For the Saints, Archie Manning was successful on 13 of 21 passes for 154 yards and a touchdown, but also tossed three interceptions. Bobby Scott went four-for-12 and 36 yards with another three interceptions. FB Tony Galbreath ran for 35 yards on 9 carries and Manning was right behind with 33 yards and a TD on 6 attempts. Don Herrmann was the top receiver with four catches for 92 yards. The Buccaneers won again against the Cardinals in their season finale and, while it lifted them to only 2-12 for another last place finish in the NFC Central, the victories allowed Tampa Bay to finish off the year on a high note and were a harbinger of improvement to come. New Orleans was blown out by the Falcons to end up at 3-11 and at the bottom of the NFC West, costing Coach Stram his job.